LG has officially unveiled two of its Windows Phone 7 handsets, the heavily leaked Optimus 7, and the decidedly chunky Optimus 7Q. The Optimus 7 has a 3.8-inch screen, 5MP camera, and 16GB of internal memory. The 7Q has a slightly smaller 3.5-inch screen, a slide out QWERTY keyboard, and is otherwise identical. SEOUL, Oct. 11, 2010 – LG Electronics (LG) today announced the global launch of its first Windows® Phone 7 devices, LG Optimus 7 and LG Optimus 7Q . Building on Microsoft’s new operating system that offers people the ability to do more in fewer steps, the LG Optimus 7 series introduces a new era for smartphones and offers consumers a whole new experience of mobile life. A direct result of LG and Microsoft’s close work together in the smartphone market, the LG Optimus 7 series offers the glance and go experience of Windows Phone 7 combined with unique features only available on the LG devices. These compelling applications — the DLNA-based Play To, augmented reality (AR) and Voice-to-Text — are available as Live Tiles on Windows Phone 7 and can be accessed via integrated “Hubs”. The LG Optimus 7 series offers a breakthrough in entertainment convenience by putting the mobile device at the center of today’s digital lifestyle. With Play To, the DLNA-based multimedia sharing technology available only on LG Optimus 7 devices, users will have the most user-friendly file-sharing experience. LG is leading the innovation of DLNA technology by offering easy and intuitive settings for accessing this feature. Play To lets users share multimedia files with other digital devices from the picture, video or music Hubs without having to access other menus. Users will be able to display videos and photos captured on their LG Optimus 7 or LG Optimus 7Q on a TV or enjoy music on their phones through their favorite speakers without wires. ScanSearch, an AR application that connects users with a world of information, is another unique feature available only on LG Windows Phone 7 devices. Users can access real-time information about shopping, dining, weather, entertainment and banking, bringing together one’s online and offline worlds for a more enjoyable life. Users can also speak up and be heard thanks to LG’s Voice-to-Text feature which allows communication without the need for finger input. LG Optimus series owners will have the freedom to transcribe their voice into text for updating Facebook and Twitter or compos-ing emails and memos for the experience of convenient, hands-free communication. 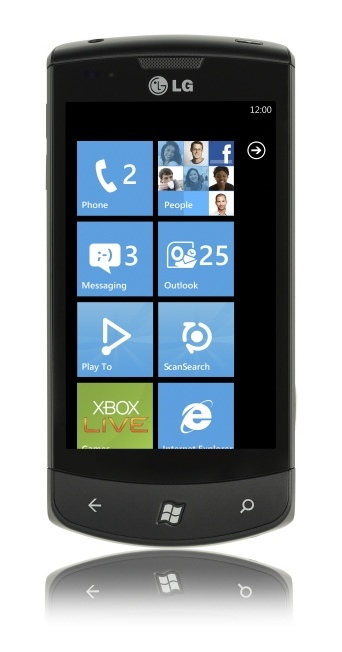 The LG Optimus 7 series helps users enjoy a new era of entertainment through the intro-duction of Microsoft’s popular Xbox LIVE® and Zune® services. Consumers will have direct access to their favorite games and music, bringing all entertainment devices together for more convenient enjoyment. LG Optimus 7 and LG Optimus 7Q immerse users in the entertainment experience with the ability to create powerful digital content. The 720p HD video resolution offers record-ing and playback of stunning visual quality and is ideal for sharing online through social media and offline on a TV through Play To. The LG Optimus 7 series also offers 16:9 as-pect capture and playback for shooting and viewing movies in cinematic style. The advanced 5MP camera offers a host of technological enhancements from LG such as Intelligent Shot, which lets users take the perfect photo without having to adjust camera settings, and Panoramic Mode for stitching together a full 360-degree landscape scene. Windows Phone 7 introduces a new approach to the Start screen experience through Live Tiles that offer easier access to information and services from the Web and applications that are important to users. The six Hubs of the OS — People, Pictures, Games, Music + Video, Marketplace and Office — organize information on the phones in a whole new way, bringing together all related applications, services and content. LG Optimus 7 comes with an expansive 3.8 inch WVGA LCD display that can capture every detail in a photo with its 800×480 pixels, the same resolution offered by the LG Op-timus 7Q’s 3.5 inch display. The screen size makes the Optimus 7 series large enough for convenient web surfing but svelte enough to fit in any back pocket. The generous 16GB of internal memory is enough to store hundreds of MP3 files, hours of video and hundreds of applications. What’s more, the extra large 1500mAh removable battery is good for hours of internet browsing, e-book reading or game playing. Or for simply talk-ing. 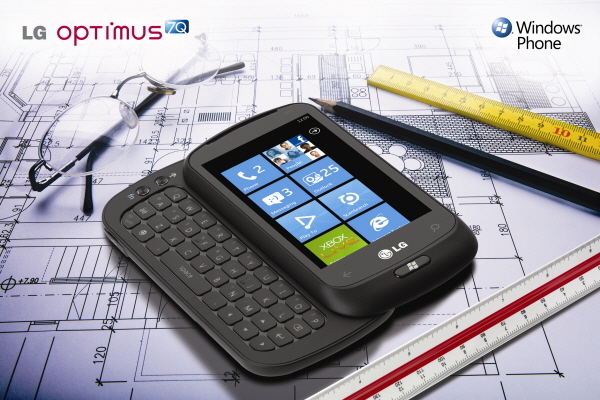 In order to offer a choice of form factors for its Windows Phone 7 series, the LG Optimus 7Q was designed with an ergonomic QWERTY keypad. LG Optimus 7Q is the perfect companion for those who want to get full value from the Windows Phone 7 Office experi-ence with Microsoft Word® Mobile, Microsoft PowerPoint® Mobile, OneNote® Mobile and Excel® Mobile functions built-in. Optimus 7 and Optimus 7Q will be rolled-out in over 35 countries via 100 global partners and operators starting with Europe and Asia on October 21. For more information, please visit www.lgnewsroom.com.